Think of the Kona Hei Hei DL as an XC bike on steroids. 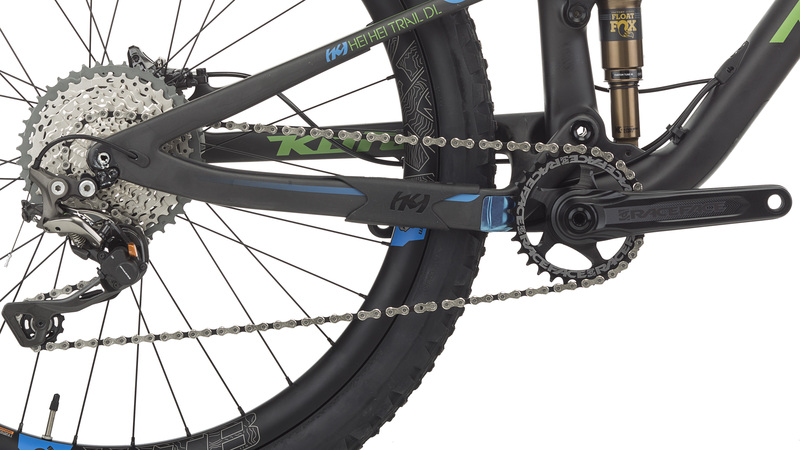 You get all the speed and climbing prowess you would expect from a XC bike, but when it’s time to point this bike downhill, you will know you’re on a bike that is so much more. The Kona Race Light Carbon is lightweight, but strong as all get out. You will never feel like you need to tip toe around while you’re riding the Hei Hei DL. 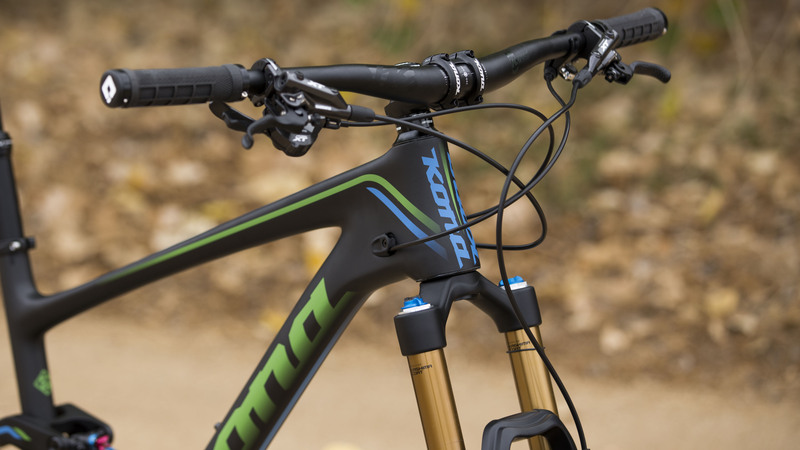 The Kona Fuse suspension platform with Fox Factory Float DPS rear shock provides efficient pedaling while remaining plush through the chatter, and then really starts to shine as the bumps get bigger. 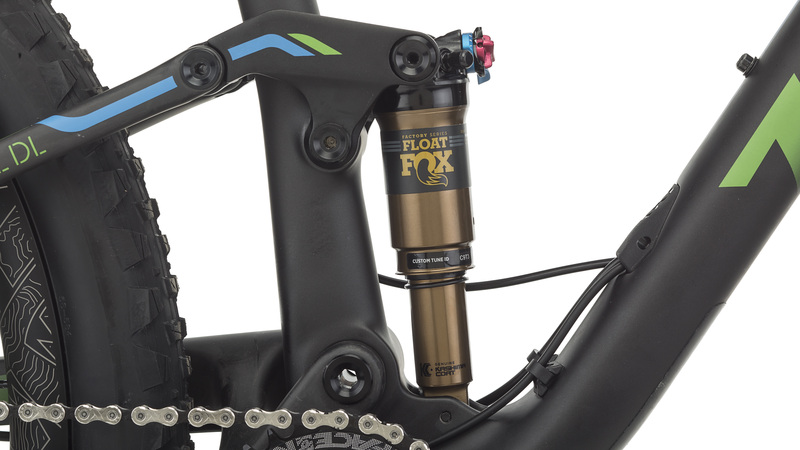 The 140mm Fox suspension up front will smooth out the roots, and gobble up gnarly rock gardens. The boost rear end provides additional clearance for tires, more precision and removes unwanted flexing. The Race Face crankset combined with Shimano drivetrain will keep the pedals turning and reward the rider with smooth accurate shifts. 27.5 wheels are big enough to supply that roll over anything feeling while remaining nimble through tight switchbacks and technical sections. Keeping it all under control are Shimano’s workhorse XT disc brakes. The Hei Hei Dl trail is an unrelenting pursuit to push the limits of what a bike can do. It is perfect for the endurance racer, weekend warrior, or experienced trail rider that wants a fast, go anywhere trail crushing machine that will turn your rides up to 11. Maxxis Tomahawk EXO TR 27.5x2.3"
The most fun on 2 wheels. This is my first trail/all mountain rig. 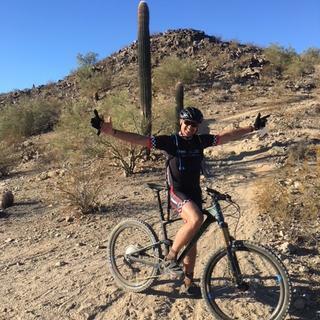 I have been an avid mountain biker for over 20 years. My first bikes were Chro Moly frames with ridged forks and I have riden every other iteration of XC bikes from AL hard tails with manitou spider elastomer forks to a Specialized Epic 26er. 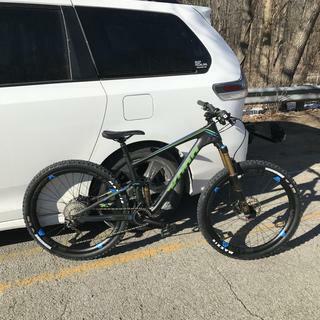 My latest is a Carbon 29er hardtail race rig. All have had 70 deg or stealer head tubes and short chain stays. All those bikes climbed like homesick angels. So for my first trail bike I was a little nervous about how it would feel and climb. After riding trails with stair step climbs and tight steep switch back climbs I am happy to say it was a very natural transition to the Hei Hei. I never felt like my climbing was limited by the bike. 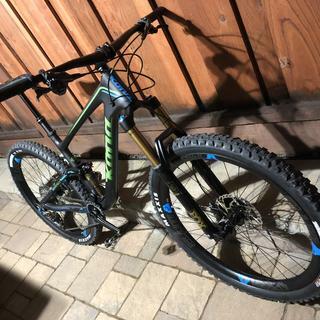 It did not climb quite as nimbly as my 29er hardtail but it did not hold me back and it never felt piggish like so many other all mountain rigs with super slack geometry. Now as for the drops, steep rocky decents, table tops, banked decents and most of the fun features on trails the Hei hey was pure fun, no comparison with the XC rigs. When things got really steep you do become aware of your front tire and you have to pick a line, but the Hei Hei will reward you with a smooth confident decent as long as you keep you eyes open. 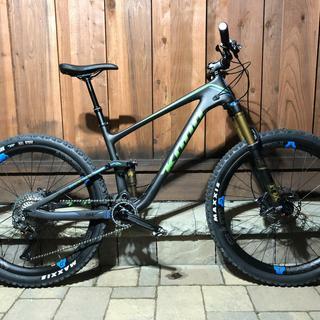 Bottom line, if you are looking for a bike you will shuttle up the hill and ride down with your eyes closed, get a super slack rig like the yeti or the kona process. If you are looking for a bike that you have to pedal up technical ascents, you can pick a line, and you don’t like the super slack piggish rigs the Kona Hei Hei trail is an excellent choice. I don't know where to start. I like to consider myself pretty bike knowledgeable and nothing about this bike made sense. However, with a lot of input of gear advisors, good friends, and online research I decided to throw inhibition aside and give it a try. I've been a die hard 29er fan. I've ridden some top tier bikes. I have to say this bike makes me smile more than anything I've ever ridden. The 68 degree head tube able should not be feared. Given the 140 fork this bike does not feel steep in the least. Given the 140 rear you may think this bike wouldn't climb well, but it climbs like a goat. The rear is lively. The 27.5 is nimble but not unstable. I've noticed zero difference in head tube angle discrepancy, I've noticed zero difference in 29 vs 27.5 (I still ride a Sir 9 hardtail). Let's talk about bang for buck. Carbon frame, Carbon hoops, alone could make up the sticker price of this bike. Not to mention essentially top tier Shimano drivetrain, which by the way I am a die hard Sram fan. However, given the aforementioned assistance in planning this purchase I reluctantly made the leap. Given the choice I would still build a bike with Sram but I will not change the drivetrain on this bike unless it breaks. There are several lucky people out there that are going to get a great bike and a great price and not regret their purchase one bit. If you're on the fence, you shouldn't be. Hit the purchase button and rest assured you've made one of the best fun per foot decisions of your life. I purchased this a few weeks ago for the trails of South Mountain and I can't be happier. It was delivered and setup to ride right out of the box. Fits like a glove. Best bang for your buck out there today. I just converted the tires to tubeless and it was very simple. No, really...I mean it. This bike truly rides like it is a living, breathing animal assisting me with every pedal stroke, every line choice, every boost. Magic is the word that comes to mind as it just melts away underneath me. "Climbs like a goat." Yes these are the words we frequently read when one refers to a stellar climbing machine. I could describe this ride with this same statement only it wouldn't exactly be accurate. Why? Because to me it climbs far superior to any bike that loosely dons this accolade. This thing longs for the top. It seeks it out, dancing its way up foaming at the mouth like a beast dashing for prey. I have been riding mountain bikes since the 1980's and never have I been on a machine like this. I remember the two Hecklers I have had (also a Reign, Meta SX and a Wideangle hardtail). All are amazingly capable bikes, but the Santa Cruz Heckler, however is often the bike from which I judge all others. I don't know what it was about the Hecklers( I owned both the 5inch and 6inch versions at some point) but I have seemed to have had the most all around good times on these things. So often when testing other bikes I ask myself...Does it climb as well as the Heckler? Is it as sure footed? Does it like to fly? Playful, snappy and giddy? The answer regarding the Hei Hei Trail is yes to all of these questions and then some. This beast is a far superior climber. Point it downhill and bombs away. So smooth and planted. An unbelievably fun snappy ride. I can't entirely explain it. The Kona just has that X factor. In one other review somewhere it is noted that at first the head angle seems a little steep but once you learn to trust it on the rowdier terrain it just goes. True that. I don't even have to go through the exceptional parts spec on this ride for the cost Jenson is presenting it. You know that right? 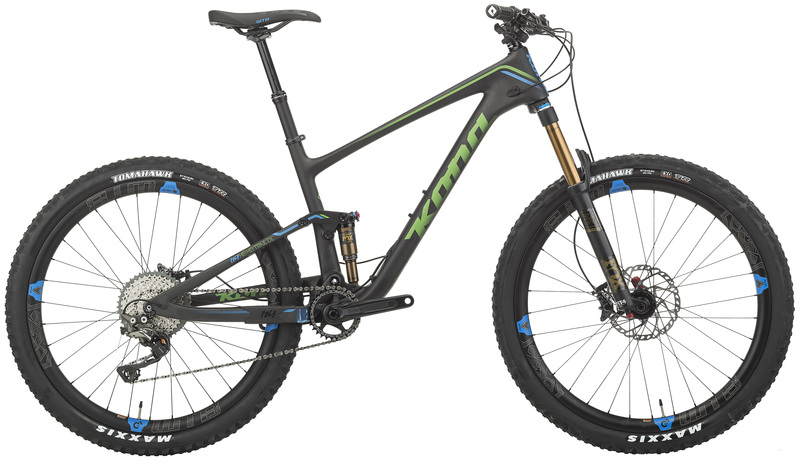 Great deal on a superb bike with an excellent build, including bombproof WTB carbon wheel set. 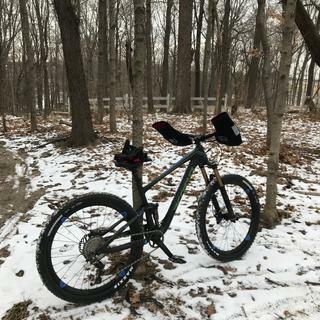 This bike is a climbing machine that also feels pretty solid going downhill, though as others have mentioned, you can definitely feel the relatively steep 68 degree head angle (i.e., need to pay attention on the steep and technical downhills). It’s a fun and versatile bike that actually makes me look forward to the next climb as well as the subsequent downhill joyride that follows. Just don’t get complacent on the downhill part. 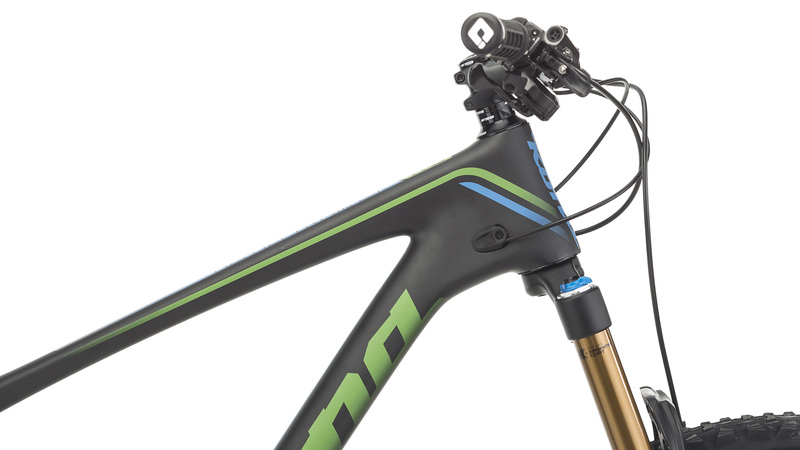 What is the suggested rider height for each frame size? BEST ANSWER: I don’t know the technical answer - probably depends on your upper vs lower body length and not just your height. I’m 5’9.5” and pretty normally proportioned with 31” inseam - a medium frame is a good fit for me. What are the specs on the handlebars width and rise? BEST ANSWER: 780mm width and 20mm rise. I swapped mine out for a Race Face Next carbon riser bar (760mm width, 20mm rise, which I trimmed to 740mm) and I like the way the bike handles better. Plus it’s nice to have the bar of all things be carbon on a prettt much all-carbon bike. I'm very interested in the KONA HEI HEI TRAIL DL BIKE 2017. I see it's kind of a crossover between a XC and a Trail bike and I had a couple of questions. Will it perform fine in long XC run, for example "Transalp" or is it not intended for long 70mile + runs full of uphill sections? I'm just worried that it will feel "uncomfortable" after long days of riding. 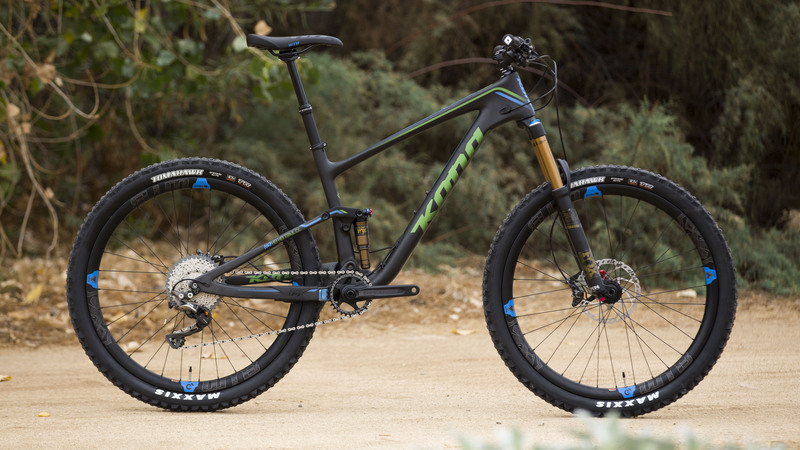 This bike is definitely trail capable, but still holds its own when it comes to pedaling. It's geometry is not overly aggressive, the build is nice and light, and the flex stay rear end has a great pedal platform. I have not ever ridden the TransAlp, but I've spent a fair bit of time on this bike and it seems like it would be a good fit for a ride like that with a good mix of ups and downs and long saddle times.